Burdock is biennial thistle in the Asteraceae family. Common Burdock grows wild in North America, Europe and Asia. This "weed" is regularly found growing alongside roads in the Chicago area and in cracks in the pavement. This is one of my favorite weeds growing in Chicago because the large lower leaves that can reach 18 inches in length and look very dramatic. I've taken to calling Burdock a "Ghetto Hosta" because I see them growing alongside property lines and I wonder if we're mimicking nature or if nature is mocking us. As a kid I was convinced they were dinosaur food because the leaves looked so alien to me. The girls on my block when I was growing up would cut up the leaves and make a pretend salads from them or the leaves would be used as a base or decoration for mud cakes. The fact that it was regularly used in pretend meals as a kid is pretty funny to me now because I've learned that in some areas of the world Greater burdock is eaten and grown for it's medicinal properties-it is also a food source for some moths and butterflies. I like this plant so much that I'm tempted to grow one in my garden but I remember the trouble it was to remove the prickly heads from your clothing, shoelaces and dogs whenever I ran through an empty lot in Chicago growing up. Which brings up an interesting point-the prickly heads helped Georges de Mestral invent Velcro. Such an interesting plant. Have had to pull them out of clothing and the like many times. Very interesting post, mrbrownthumb and very timely for me. 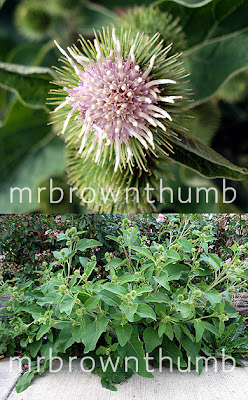 I just did a recent post on the mystery plant in my garden and discovered it was Burdock, with which I'm not familiar. Unfortunately the bugs got it before it could bloom. The leaves must taste yummy. You know I haven't had to do so in many years but I wonder how many of the plants growing now in the neighborhood are descended from seed pods I helped distribute as a kid running around. 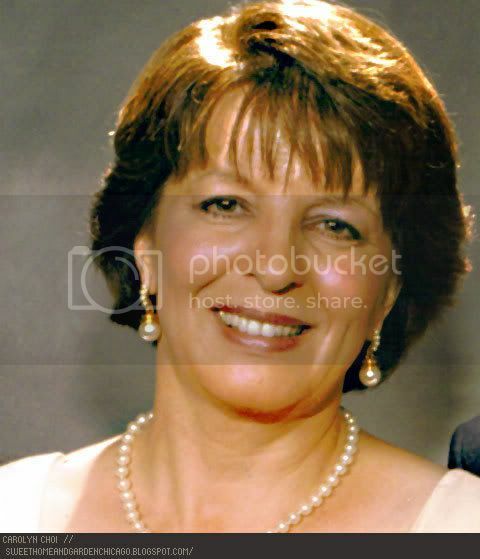 I wish I would have checked your blog when you were asking for an ID...and saw the subsequent entry on it. I have something chewing on the leaves in my garden now that I will have to direct to the Burdock plants growing down the block.